Discover the expert health & nutrition answers you need now. Start your RISK-FREE subscription to Tufts Health & Nutrition Letter today! Plus: A risk-free offer of Tufts University Health & Nutrition Letter! It’s no wonder then that some companies try to make unhealthy foods appear healthier than they really are. Take “trans-fat free” foods. Despite the label claims, some of them contain trans fats that increase your risk for heart disease! Thanks to an FDA loophole, if a food contains less than a half-gram of trans fats per serving, it can be labeled as “trans-fat free.” You think you’re not taking in any trans-fats, but the reality is you could be gobbling them up. And the food aisle isn’t the only place you and I are getting fooled. If you’re like me, you may take certain vitamins and supplements to boost your health – yet some of them – common ones you may be taking right now – can harm your health! For example, the wrong dose of calcium could double your risk for a heart attack! Researchers have shown taking large doses of calcium in supplement form may be dangerous – with one study showing high doses nearly double the risk for heart attack. The reason is your body doesn’t treat large doses of the supplement the same as calcium from foods. That means, not only are these high doses unsafe – they may not even be helping you protect your bone health. What’s more, too much calcium or vitamins A and E may increase your stroke risk. And, despite some claims, there is no research to support that vitamin C can lower stroke risk. So how can you avoid the food and nutrition mistakes that seem to lurk in every aisle – and do what’s best for your health? Introducing the Health & Nutrition Letter from Tufts University! You may not know a lot about Tufts – I didn’t either. But the Friedman School of Nutrition Science and Policy at Tufts University is the world-renowned leader in health and nutrition breakthroughs. What’s more, Tufts is home to the largest research center in the world dedicated to discovering how proper nutrition can prevent or reduce the effects of disease related to aging. Tufts scientists research the health information you and I want to know, like best ways to strengthen our bones… foods that fight cancer… and the nutrients that can boost your memory or help you fight heart disease. That’s why I tell everyone, if you’re over 50, you need to be reading Tufts Health & Nutrition Letter! The breakfast food that lowers your heart failure risk! Why sugar-sweetened drinks are so harmful for women’s hearts. The easy way to drop your blood pressure significantly – no medication needed! Critical cholesterol update! Why high levels of HDL (good cholesterol) may not do anything to lower your risk of heart disease! How increasing vitamin D levels helped lower blood levels of C-reactive protein (CRP) a sign of increased risk for heart disease. Recently readers discovered that increasing potassium levels while reducing the amount of sodium in your diet is one of the most important ways to lower your risk for cardiovascular disease. High potassium foods include bananas, apricots, fish, nuts and more. A food that could slow the onset of dementia! It’s already showing amazing results! How to lower your risk of Alzheimer’s by eating fish just once a week! Did you know if you’re not getting enough vitamin B12 – your brain might actually be smaller? Surprising way some fats affect your brain – while others actually help you keep your memory as you age! How delicious berries could protect your memory and shave years off your cognitive age. Amazing way strength training can pump up your mental muscle! Avoid foods that could raise your risk for the most common type of stroke by nearly 40%! How you can use potassium to lower your stroke risk by 20%. How you can lower your systolic blood pressure (the top number) as much as 10 points by eating raisins! Why women should eat plenty of citrus fruits to help lower stroke risk. 13 foods that may help lower your risk of stroke. 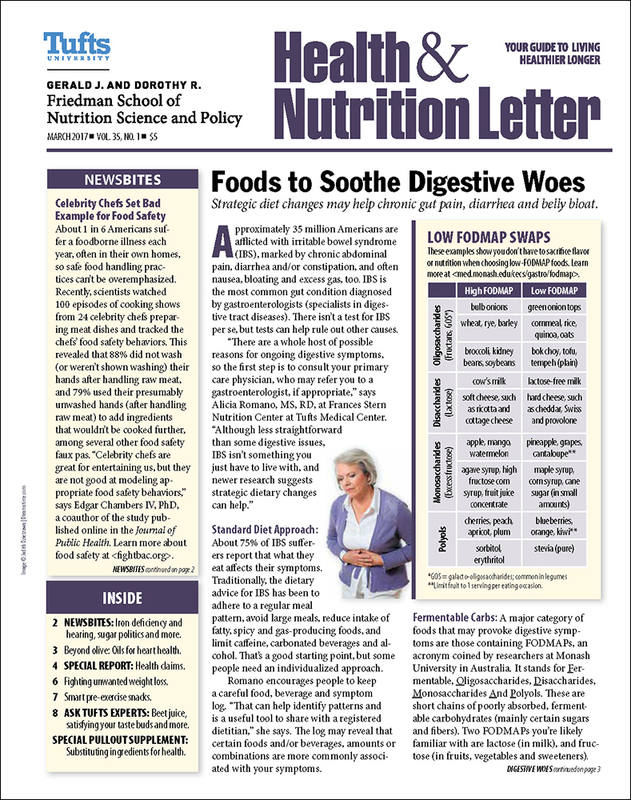 And there’s so much more in every issue of Health & Nutrition Letter. The recent study that shows coffee drinkers live longer! How low-fat yogurt may keep you from developing type 2 diabetes. Or the food that helps stop you from packing on deadly belly fat. Even why some low-fat dressings make it harder for your body to absorb the fat-soluble nutrients in your salad veggies like carotenoids. Instead of looking for “low-fat” dressings, try those made with monounsaturated fats like those found in canola and olive oils! Did you know: you can stop the sniffling and sneezing from colds faster? Zinc lozenges or syrup will do the trick. You can add years to your life in just 15 minutes a day? What’s better – a cup of OJ or an orange? The orange – you’ll get 8 times the fiber and just two-thirds of the calories! You can count on every word you read in Health & Nutrition Letter, because it comes straight from the scientists, doctors, and researchers at Tufts University. You not only get facts about research done at Tufts – you also get Tufts unique perspective on health and nutrition findings from all over the world. We’ll tell you when something really is a new breakthrough – and also when we feel an idea needs more scientific proof before we give it our seal of approval. For example, recently many publications, and even network news stations, were telling you to take supplements to stay healthy. Tufts exploded that myth so you would know that many multivitamins, including supplements of B6, folic acid, magnesium, zinc, copper and especially iron, were all linked to a greater risk of dying. Are you taking too much E? Researchers found that 23% of people are taking 18 times more than the recommended level. And for adult men that increases their risk of prostate cancer 17%! Too much vitamin A can actually increase your risk for stroke! Beware anti-cancer supplements. Not only is there very little support to show supplements can help protect against cancer – high doses of some supplements actually increase your cancer risk. Is vitamin K2 the answer for osteoporosis? Our experts tell you why it isn’t worth the price. It turns out the best way to get the nutrients you need – is to eat them! So, when the government updated their food pyramid into the new MyPlate version—Tufts went a step further and created a special MyPlate for Older Adults specifically designed to help folks over 50 get the nutrients they need from fewer calories. That’s why Tufts Health & Nutrition Letter is so important for everyone over 50. You get the nutrition research and expertise you need as you age. But why take my word for it, when you can see for yourself just how useful Tufts Health & Nutrition Letter will be for you. Don’t miss your chance to get the best health and nutrition news available. Start your risk-free subscription to Health & Nutrition Letter today!